Last Saturday, I was invited to a housewarming by my friend Elsa. I asked her if I should bring anything and she asked if I could make some cookies. Yes, yes of course I could make cookies. The recipe is adopted from the cookie recipe found under the lid of the Quaker Oats Old Fashioned container. Heat oven to 350. In large bowl, beat butter and sugars until creamy. Add eggs and vanilla. Beat well. Add flour, baking soda, cinnamon, and salt. Mix well. Add oats and cherries. Mix well. Drop dough by rounded tablespoons onto ungreased cookie sheets. Bake 8 to 10 minutes or until light golden brown. Take care not to overcook. Cool 3 to 5 minutes on the cookie sheets before removing to completely cool on a wire rack. Store tightly covered. No one in my household likes radishes. Not really, anyway. Neither M nor (e) eat radishes. I like them, but only in very small amounts in salads. The sharp spiciness can be quickly overwhelming for me. Note: daikon is the exception. Daikon is so mild that I can eat a lot of it and (e) enjoys it in some applications. Last year, our CSA provided us with a number of radish bunches and I learned to use their tops to make pesto but was always at a loss to what to do with the actual radishes. I tried roasting them and accidentally overcooked them. This year, I am experimenting with pickling and preserving, thanks to (e) giving me a kimchi-making kit for Christmas, and decided to pickle the CSA radishes. My online research led me to many different recipes. Most used cider vinegar, which isn’t in my larder, so I filed those away for later. A few used rice vinegar, which I also don’t have. I managed to find one which used plain white vinegar, which I do have in stock. This recipe on how to preserve radishes on “grow it cook it can it” includes a much larger set of herbs than I grow in my garden, but it seemed doable so I went for it. I had to make adjustments based on what was in my larder at the time. Garlic for garlic stem. No fennel (blech, I am not a fan). No fresh marjoram in my garden. Also, I had only a small bunch of radishes, so I cut the recipe to a third. This isn’t a “quick pickle”: I had to wait three days before seeing if I would like the recipe. I really loved how the radishes turned out! Still crispy and fresh but their bite has mellowed, replaced with a wonderful tart pickle flavor. I opened the jar and pretty much ate all except two radishes, which probably won’t last the night. Looking forward to making this again this Tuesday. In a nonreactive pot, combine all the ingredients except the radishes, 1 sprig of thyme and 1 sprig of oregano. Bring to a boil on high heat, then turn to medium and simmer for five minutes. Turn the heat off and let the mixture cool completely. Nearly cut the radishes into quarters lengthwise but don’t cut through one end, so they end up exposing more surface area to the pickling liquid without cutting the radishes into slivers. I used the photograph at “With a Glass” of pickled pink radishes as inspiration. Pack the radishes into a clean jar of appropriate size (mine fit into a pint jar), including the remaining sprig of thyme and oregano. Remove the garlic, and the sprigs of thyme and oregano from the cooled pickling liquid before pouring the brine into the jar so it covers all of the radishes. Cover tightly and refrigerate for at least three days before eating. Welcome 2014! Another year and another series of adventures in #CSA. Having done this last year with the same farm, we’ve come to know what sort of veg to expect so I was excited to get started this year. Like last year, my sister, (e) and I are splitting a full share, since we’re both two-person households and the thought of going through an entire veg share on our own was daunting. (e) got the other small bunch of spinach, a head of red-leaf lettuce, a bunch of kale, and 1lb potatoes. I’m, unfortunately, not a big fan of kale and we already had greens in our fridge. Last year I had great success with using the radish tops for pesto and it’s one of the recipes I was eager to get to this year. The radish bunch was small, so I wondered if it could be supplemented with the small bunch of spinach. After looking at recipes, it seemed that I could combine the two in a single pesto recipe. Last year, I modified a version of this radish leaf pesto recipe from Chocolate & Zucchini. I eliminated the lemon, added more garlic, and toasted the pine nuts. This year, I spotted allrecipe’s spinach basil pesto and given the crossover of ingredients, decided it could work. The combination resulted in a very fresh-tasting pesto that goes great with toasted french bread or cheese ravioli. Yum! Take the pine nuts and toast them in a dry pan on the stove top. Be careful not to burn them. I like getting them to look toasty, but they should be fine once you can smell them. Place the toasted pine nuts, spinach, radish tops, Parmesan, garlic cloves, and 2 tablespoons of the olive oil into a food processor and blend until finely chopped. The consistency is quite thick, so you may need to scrape down the sides of the processor a few times. At this point, add salt and pepper to taste. If necessary, add oil to your desired consistency (I always add an additional tablespoon). This past week, I got a delivery of ten pounds of organic blueberries from southern New Jersey from our CSA (new this year, so I am very excited to eat vegetables seasonally). I dove into research on what I could make that fits my baking and cooking criteria. I am part of a small household, so there aren’t many mouths available to consume my baked experiments, especially as I am diabetic and should be limiting my carbohydrate intake. So, I turn to small batches. Baking for one to three makes not wasting the end product much easier. I also want small batches so that I can bake frequently. It’s no use to me if I can’t cook a recipe repeatedly over a short period of time. I learn best by doing and repetition, so small batches done frequently allows me to learn the recipe. It also allows me to do variations, tweaking as I go along, to get the recipe to suit my tastes. This ensures little waste and quick development to something I love. In light of the blueberry acquisition, I turned to my newest baking book, “Small-Batch Baking” by Debby Maugans Nakos. She has a recipe called “Blueberry Granola Whole Wheat Muffins”. It sounded delicious, but I have had little success finding granola recipes I like. Too often, store-bought granola are packed with dried fruit in greater proportions than I would like and with less nuts than I would like. So, I started researching granola recipes. I turned to a constant favorite for recipes: Alton Brown. His granola recipe looked simple but it had a number of ingredients I didn’t like. I am not a fan of cashews in granola. Almonds, yes. Walnuts, sometimes. Peanuts and cashews, no. It also contained shredded coconut, a huge no-no for me as I do not care for dried coconut in almost every form. Lastly, it contains raisins, which I like but only in small amounts in granola. Also, given that the granola is going to end up in blueberry muffins, I don’t think the raisins would be suitable, so they would have to go as well. To keep the general proportions of stuff the same, I substituted additional almonds to replace the cashews and eliminated the coconut and raisins entirely. I also halved the batch, in keeping with my small batch baking philosophy. At the time I was making granola, I was called into a work meeting and couldn’t “watch” the batch well. My partner, M, took over and had issues with the oven, so we ended up cooking it for an indeterminate amount of time in an oven of indeterminate temperature. Thankfully, the first batch turned out wonderfully, especially spooned over vanilla ice cream and fresh blueberries. 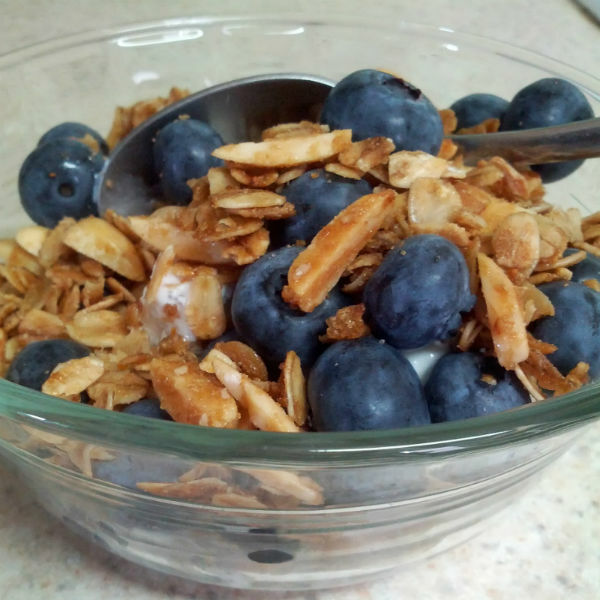 Granola with fresh blueberries over vanilla ice cream. In order to get the recipe right, I made a second batch. This is made doubly complicated as I believe my oven to run cool compared to other ovens: it seems to take the maximum stated cooking time to get baking recipes right. It came out equally lovely: toasty golden, not too sweet with delightful crunchy bits to give the granola a good bite. The key is to watch the cooking process by checking the mixture regularly and mixing it to ensure even toasting. Next time: blueberry granola whole wheat muffin adventures! Combine oats, almonds and brown sugar in a large bowl. Be sure to crumble the brown sugar so that lumps are minimized. In a separate bowl, mix the maple syrup, vegetable oil and salt. Pour the wet mixture over the dry mixture and stir well to combine. Make sure all of the oats are coated and glistening. Cover a baking sheet with parchment paper and spread the granola over it in a fairly even layer. Bake for one hour and 15 minutes at 250 degrees. Every 15 minutes, check on the mixture and stir it well so that it cooks evenly. Turn the heat up to 350 degrees F and bake it at the higher temperature for 20 minutes. Every 10 minutes, check on the mixture and stir it well so that it cooks evenly. If your oven runs hot, you may find your mixture is golden toasty after the first batch of cooking at 250. Feel free to take it out at that time. If your oven runs cool like mine, the extra baking at the higher temperature will help bring it to the proper state. Let the mixture cool in the tray. When cooled, break it up and store it in a covered plastic container. It will last well on your kitchen counter for several days assuming it lasts that long. Variations: substitute sunflower seeds for half of the slivered almonds. Double the salt for a deliberately salty-sweet combination. Add dried fruit or chocolate chips after it has cooled.